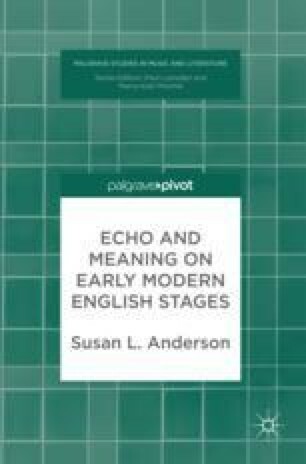 Anderson outlines the range of meanings made available by the use of echo techniques in early modern drama and poetry. This chapter establishes different levels of echoic meaning, including musical repetitions, verbal alterations, intertextual references and textual revisions. This chapter draws attention to variations between early modern translations of Ovid’s version of Echo’s origin myth and within different editions of Golding’s translation of the Metamorphosis. Anderson also examines the use of echoic techniques in Sidney’s Old Arcadia and the alternative origin story of Echo in Longus’ Greek prose narrative Daphnis and Chloe. This chapter argues that Echo is a figure of distortion and adaptation as well as repetition, and serves as a productive way to represent historical inquiry itself. Syme, Holger. 2014. “Where is the Theatre in Original Practice?” Dispositio (blog). http://www.dispositio.net/archives/1942.